The Higher Defense Council assigned the security apparatuses to take all the measures to prevent any violation of security and to preserve civil peace in the country. The Council declared that it discussed means to ensure the needs of the security forces in order for them to be able to perform their duties and distribute missions to concerned administrations, keeping its decisions confidential in accordance with the law. 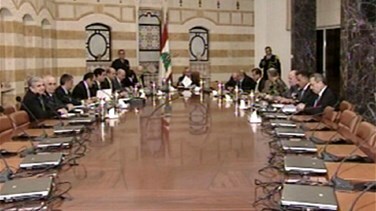 The Higher Defense Council convened on Wednesday afternoon at the Baabda palace, upon the call of Lebanese President Michel Sleiman, and in the presence of Prime Minister Najib Mikati and other concerned officials. Conferees included Ministers Wael Abou Faour, Nicholas Sehnaoui, Shakib Qortbawi and security leaders. Participants are expected to take adequate decisions that are to remain confidential in accordance to the law. Earlier in the day President Sleiman met with UN Special Coordinator for Lebanon Derek Plumbly who informed him of the regular report on the implementation of resolution 1701, expressing appreciation for the efforts deployed by the President by calling for dialogue in order to maintain stability. The meeting also tackled the necessity of increasing the aid sent to Lebanon to enable it to shelter the Syrian refugees in a decent and acceptable way under the current circumstances.